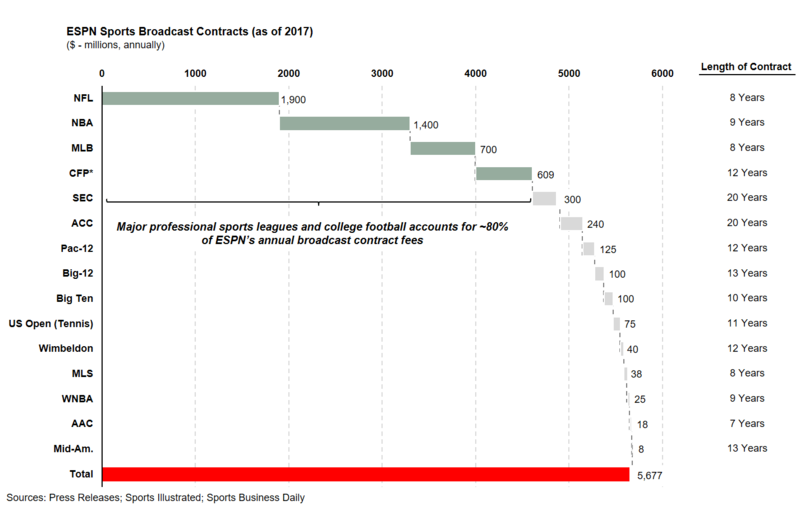 Sports broadcast contract values have ballooned in the past decade – and players like ESPN may end up holding the bag. It seems as if no matter where you turn, the end of Pay-TV is nigh. Myriad factors, including cord-cutting, millennial viewership, and disruptors like Netflix or YouTube, are collectively placing pressure on the traditional Pay-TV model creating a struggle for legacy players who are attempting to retain relevance, viewers, and advertisers. In this evolving media landscape, legacy players are finding that their core product, TV programming, is under attack from an ever-expanding set of competitors that are spending heavily to pry viewers away. 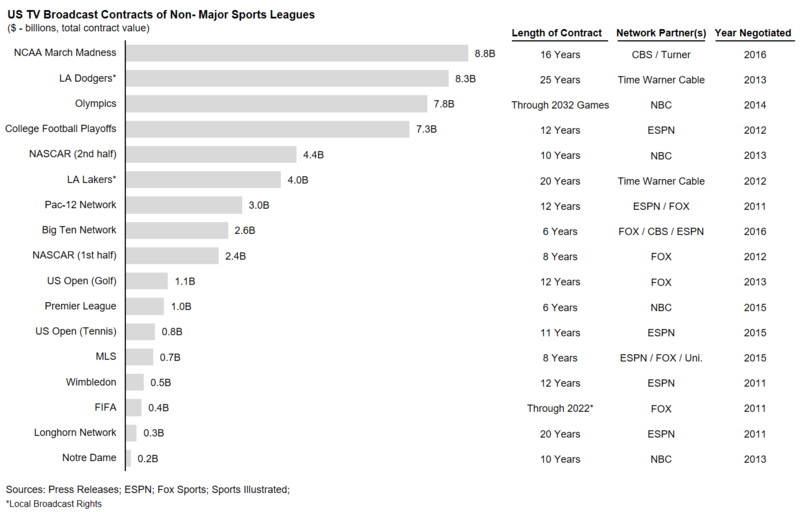 As a result, TV’s best content assets – live sports – have become increasingly important to legacy players. 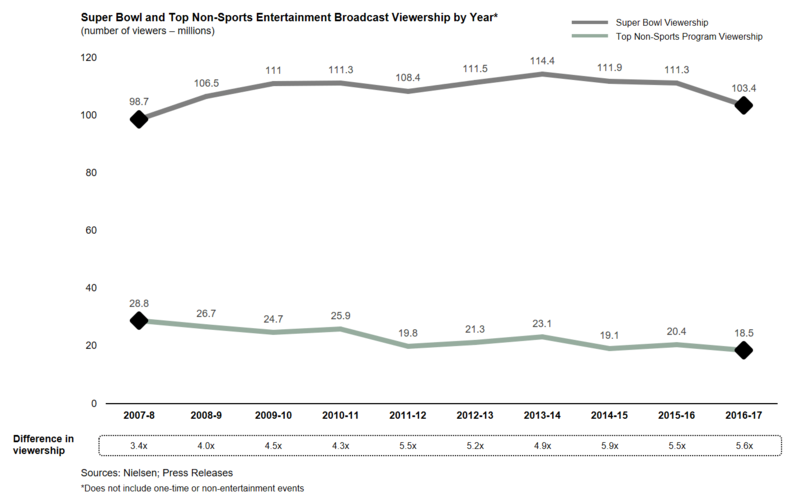 While viewership for the Super Bowl has declined over the past few years, there has been a similar decline in TV viewership that has only highlighted the importance of live sports content – even with a 7% decline in viewership for Super Bowl LII, 9 of the top 10 largest TV broadcasts in history are the Super Bowls from 2010 onwards.1 It’s no wonder that the cost of sports rights have ballooned in recent years and observers are wondering when the “bubble” will pop. The doubling of contract values underscores how valuable sports have become to legacy players – the renegotiated contract terms generally stayed the same, with no major changes in number of games, playoff games, or even digital rights, as evidenced by the NFL’s decision to sell Thursday Night Football digital rights to Twitter / Amazon. The networks are effectively paying more than double for the same product and may even see viewership declines (i.e., NFL). However, even in a market where rights fees are exploding and are increasingly exposed to risk of viewership declines, media players have still locked up billions of dollars into all types of sports contracts to shore up weaknesses in other content categories. What Goes Up…Sometimes Comes Down? Many of these contracts represent double or triple their previous values, and again validate the importance networks and cable channels are placing on live sports. After the Fox / TNF deal, the rights landscape is likely to remain calm for a few years at the national level, but even this lull is driven by the fact that all major content assets have already been locked up. 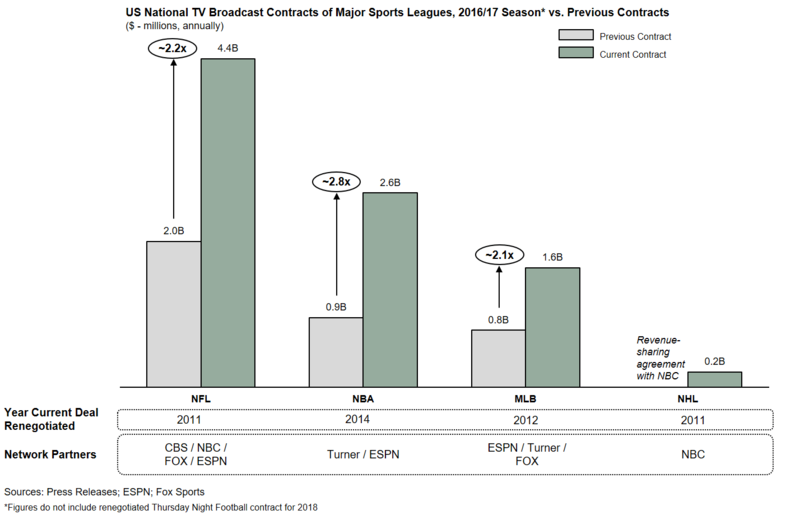 However, starting with the expiration of the MLB contract after the 2021 season and the NFL contract after the 2022 season, there will be another flurry of negotiations – but with cord-cutting and other trends slowly bleeding away the Pay-TV customer base and viewership, it remains to be seen if contract values can continue increasing or if they will finally start falling. All the Content, but is Anyone Watching? ESPN has been particularly aggressive in recent years, buying rights for a significant premium at times or pursuing rights that may be more niche / targeted. Case in point, when ESPN renegotiated its “Monday Night Football” contract in 2011, it paid $15.2B in total or $1.9B yearly to renew those rights – in contrast, NBC is only paying $950M a year for “Sunday Night Football”. However, in terms of viewership, ESPN averaged 10.8M in 2017 whereas NBC averaged 18.2M.3 Not only is ESPN paying more than double NBC’s price, they are also drawing 40% less viewers. In the past, the advantageous economics associated with ESPN allowed them to overpay and still generate solid profit, but as cord-cutting and demographic shifts continue to cut into ESPN’s subscriber base, the value of their sports contracts – nearly $5.7B a year – become increasingly tenuous to maintain. Ultimately, ESPN may serve as the poster child for this era of sports broadcast rights – where “less is more”.